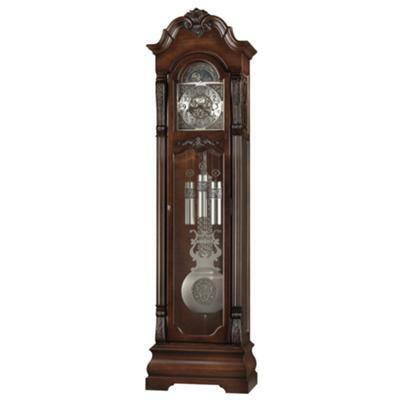 Looking for a perfect wedding anniversary gift for ourselves we settled on a Howard Miller Neilson Grandfather Clock . We think it is positively great and we spent hours just looking at it, we are so happy with our purchase. Since 1926 Howard Miller has been constructing high quality clocks and this is still true till today. The clock is made from traditional cherry wood and veneers. The end result is very elegant. The cherry wood gives an aged look which is very appealing. The clock dial is made of brushed nickel adding to the overall beautiful design. Brushed nickel pendulums and weights exquisitely carved compliment the dial. Beveled glass at the front and sides allow easy access. It is cable driven movement for easy winding, which keeps time accurately, playing the Westminster chimes. Very charming. The movement is a German Kieninger. A couple of super features which I can further recommend are the automatic silence option, meaning you can turn the chimes off at night time and the illuminated dial.